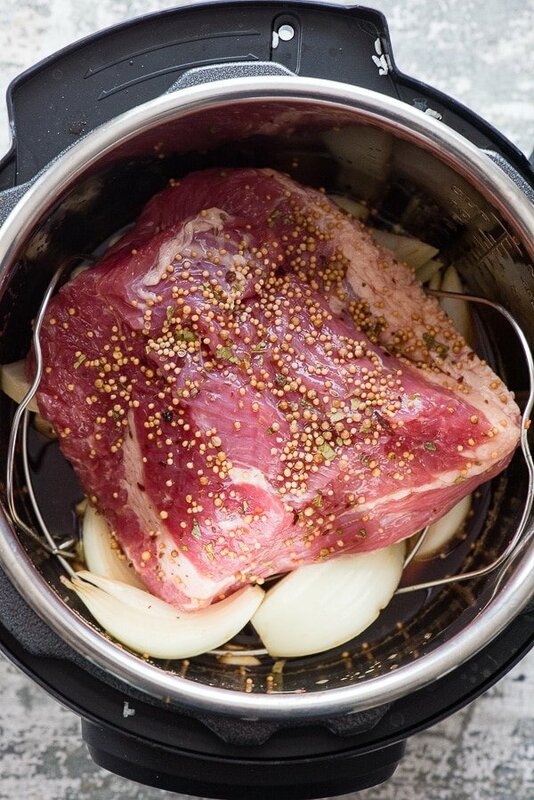 Making Instant Pot Corned Beef Brisket is so easy and also tenderizes the brisket faster thanks to pressure cooking. 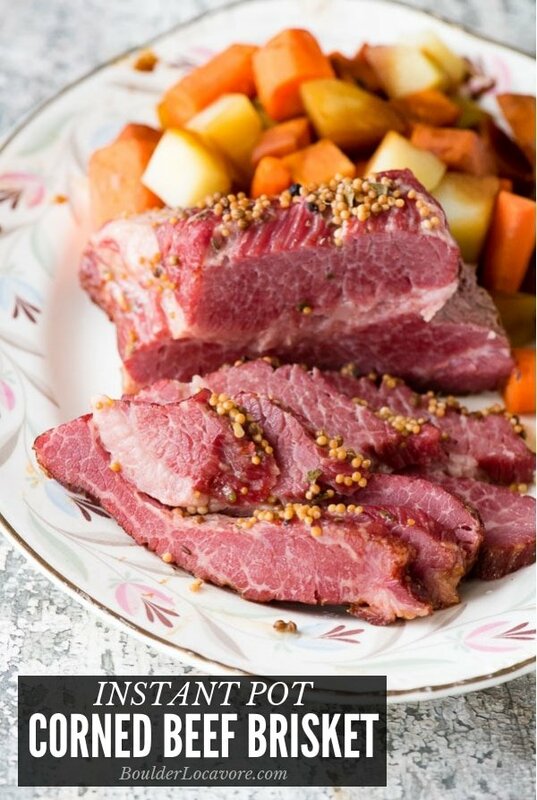 A special twist gives great flavor and tenderizes it further: cooking the Instant Pot Corned Beef in beer! Though not a traditional Irish recipe to celebrate St. Patrick’s Day, it is a popular American recipe for the holiday and for good reason! Corned Beef Brisket is a brine-cured beef brisket. 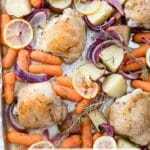 The brining adds both flavor and makes it very pink in color. Once cooked the corned beef has a perfect texture for slicing and eating as a main dish or thinly for sandwiches. Corned Beef brisket is sold pre-packaged in brine with a specific seasoning packet to cook with it giving it a signature flavor. 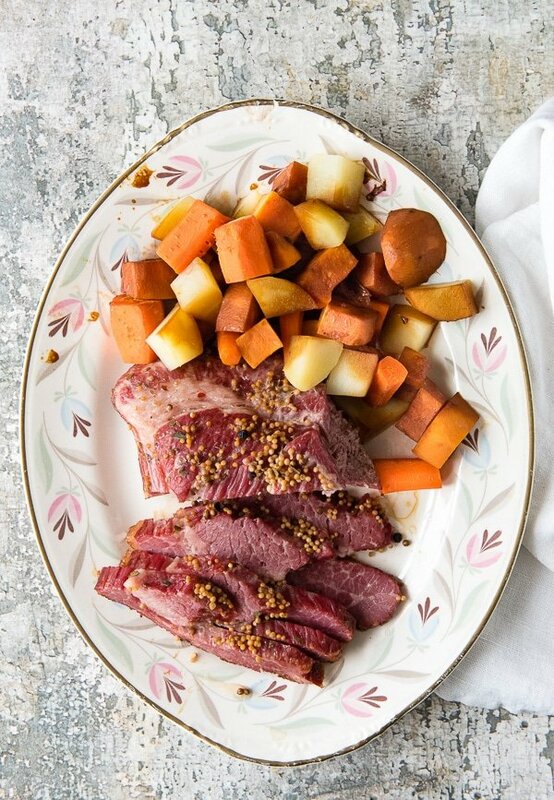 Once cooked the Instant Pot Corned Beef Brisket has a mixture of salty, meaty, and tangy flavors thanks to the brining and cooking processes. The addition of vegetables make this a full meal in one pot. Please check the recipe card below for specifics. 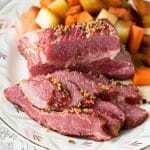 What Beer to Use for Instant Pot Corned Beef ? I recommend using a dark beer for this recipe. Guinness is a perfect choice. If gluten-free: I used Green’s Gluten-Free Dubbel Dark Ale. If Holidaily Brewing Co. gluten-free beers are available in your area, Riva Stout is a a great choice. For those of you who are not into beer, the Instant Pot Corned Beef Brisket does not come out TASTING like beer so never fear. You also can’t get drunk from eating it. Substitution Option: If you feel strongly about not using beer you can substitute water or chicken stock (beef stock is very strong tasting and I think will affect the end flavor of the brisket). Corned beef brisket is a saltier, fattier cut of meat. When you buy it, it will have already been brined and the liquid in the package is brine as well. The brined brisket should be thoroughly rinsed before cooking. It can also be soaked for an hour before cooking to release even more salt. If you have a very fatty cut, you can trim the excess fat before cooking (it’s easy to trim after cooking too). Also place the fatty side down in the Instant Pot. I chose to cook the brisket in beer which I have found makes it more tender and flavorful. 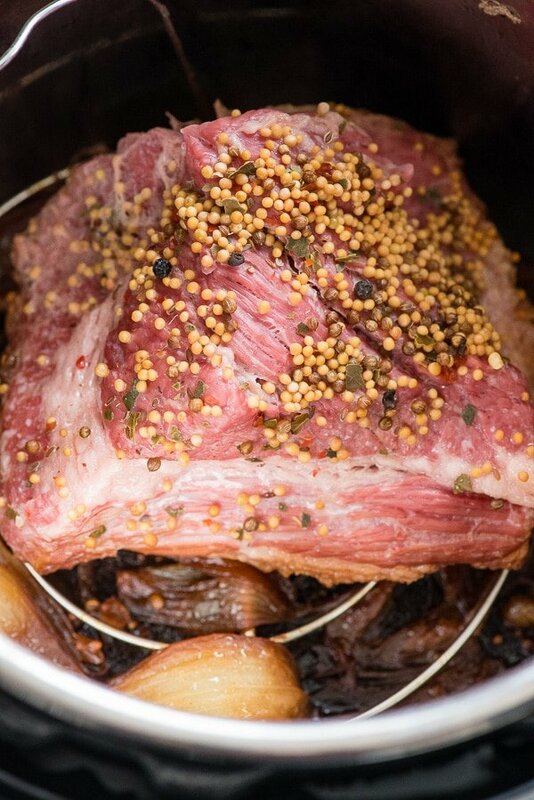 Love Corned Beef Brisket? Buy it Now! 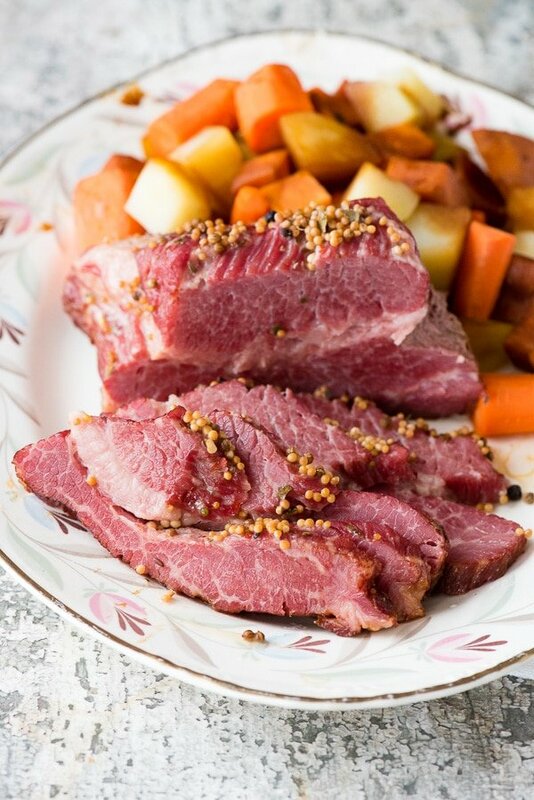 With St. Patrick’s Day coming soon corned beef brisket is available in most grocery stores. Did you know most stores do not carry it year-round? If you love corned beef brisket, buy extra and stick it in your freezer now so you can make Instant Pot Corned Beef ANYtime! Cooking Instant Pot Corned Beef is so easy! Please refer to the recipe card below for detailed instructions. Cover the rack with onions cut into wedges and garlic. Sprinkle the spices that came with the brisket on top of the corned beef. Pour the beer (gluten-free or regular) around the brisket in the Instant Pot. Seal the lid and cook the brisket at High Pressure for 90 minutes. Do a quick release and remove the brisket to rest. Add the prepared carrots and potatoes to the Instant Pot; and cook on Manual High Pressure for three minutes. Remove the vegetables and slice the brisket for serving! TIP: Adding the vegetables just at the end ensures they are cooked but still firm and delicious! 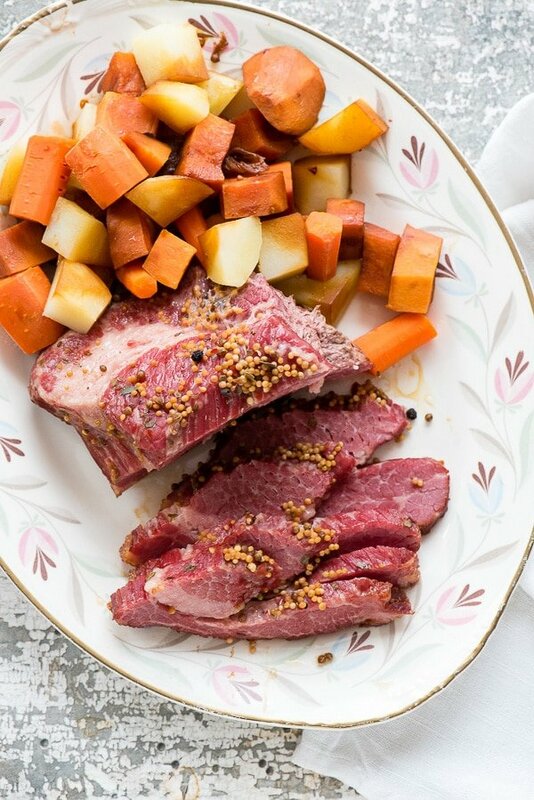 For those who have not jumped on the Instant Pot bandwagon, this Slow Cooker Beer-Simmered Corned Beef and Vegetables recipe is also fantastic way to prepare it. Cooking a corned beef brisket in the Instant Pot yields a supple, flavorful brisket with no effort. The beer tenderizes and flavors the brisket. The vegetables cook in a flash! Insert the rack into the Instant Pot. Add the onion and garlic to the 6-quart Instant Pot distributing it evenly on the bottom. Remove the Corned Beef Brisket from the package, reserve the spice packet and rinse the meat thoroughly. Place the brisket in the Instant Pot on the lift-out rack (if there is a fattier side put that facing down) and sprinkle the seasonings evenly on top of the brisket and around it in the pot. Pour in the beer around the edges of the Instant Pot (to keep the spices on the brisket in place). Add the lid to the Instant Pot, select MANUAL High Pressure (default pressure setting) and 90 minutes. When done, do a QUICK RELEASE of the pressure, remove the brisket, brush the seasoning from the top of the brisket (more difficult to remove when it has cooled) and allow to rest. Add the potatoes (on the bottom) and carrots (on top of the potatoes) to the Instant Pot. Seal and select MANUAL for 3 minutes on High Pressure. When done do a QUICK RELEASE and remove vegetables with a slotted spoon. Slice the Corned Beef across the grain and serve on a platter with the vegetables. The cooking juices may be spooned over the meat to keep it moist. This was so easy to make and so delicious. Can’t wait for Hash and corned beef sandwiches with the leftovers. Thanks so much for a superb recipe. It will be my go to from now on. So glad to hear it! 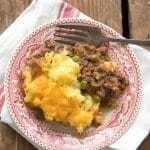 I made it myself yesterday (along with some Colcannon that is also on my blog) and was thinking Corned Beef Hash is the next incarnation of this corned beef brisket! A good recipe, but I can offer some improvements if you are willing to use a 450F oven to lesson the boiled taste and boost the appearance. Before serving the meat, I put it fat-side up in a baking pen, smeared the fat with a light covering of Dijon mustard and a sprinkling of brown sugar. Then I put it in the preheated 450F oven for 10 minutes. I put the vegetables in a separate lightly greased pan and cooked those for about 10 minutes. I also cooked an allrecipes recipe for oven- roasted cabbage to go with the meat and vegetables. I also reduced the stock and adjusted the seasoning. I added a peeled and cut Granny Smith apple and a bit of honey to cut the saltiness. All in all it was a success- I wish I cooked more for some great leftovers! 4 adults and 2 children ate the whole dinner and enjoyed it. I would attach a picture but there doesn’t seem to be a way. Oh my word I’m so hungry now! I love your additions; I can almost taste them. Thank you for sharing! This looks perfect. I have to make (3) briskets. Would I cook them for the same amount of time or does it need to go longer? Gosh Pat I’m stumped! I made this again today and can’t imagine fitting more than one brisket in my Instant Pot. Between that and the vegetables it takes up most of the room! Not sure what to advise, sorry. Quick question a lot of the instant pot recipes use a lot more liquid (most say 4 cups) for making the corned beef and cabbage, this one only uses the 12 Oz beer? And that keeps it moist? Also the vegetables cook up in this same 12oz of beer is all? Love me a good Guinness so would be happy to use that, but first time making this and making it for family so would like it to turn out moist and excellent. Hi Dart. I’ve made the recipe multiple times as written and it’s great (you can look at other reader comments too). I’m actually making it again today and happened to have 16-ounce cans of beer so used 16-ounces but have always made it with 12-ounces before (if you add more beer it’s not an issue should you have a larger can/bottle of Guinness in your case). Corned Beef Brisket is very salty out of the brine which is why I indicate to rinse it thoroughly. Some recipes suggest a higher liquid amount to leach the saltiness out during cooking; I’ve not found that to be an issue with my method. It’s also a fatty cut of meat so stays moist. Yes the vegetables cook with the same liquid. You just removed the brisket, add the vegetables and complete the recipe. If for some reason you find the liquid has depleted below the minimum for your Instant Pot (1 cup for a 6-quart) add more but that would be unusual and an indication to check your Instant Pot seal. 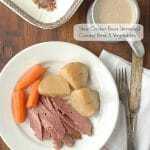 The vegetables are cooked but firm (not mushy) and the corned beef is sliceably delicious! can I make this in a 3 qt. instant pot. Hi Steve. I have only made the recipe as written in a 6-quart Instant Pot. There are certainly articles on the internet about converting 6-quart recipes for a 3-quart or 8-quart Instant Pot to guide your conversion. However my concern would be the volume of ingredients. I don’t know if a corned beef brisket and the vegetables would all easily fit in a 3-quart Instant Pot or not. Sounds like time for an experiment! 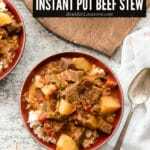 What a great idea to make this in the Instant Pot. Thank you so much for all the tips! Love that I can make this in my Instant Pot! Looks fabulous! I am going to make it this weekend for my loving family! I can’t wait! Love the idea of making this in the instant pot! So much faster! Yum! Such a beautiful color. I love how easily this meal comes and all the tips you included. Perfect for the instant pot! This is incredible!! I bet it tastes amaaaazing!! I cannot wait to make this again. It was such a hit in our house, nothing left! With St. Patty’s day just around the corner, this is fantastic!